Jason Tovey is looking forward to battling Duncan Weir for the No.10 jersey after the stand-off signed a two-year contract with Edinburgh. The Welshman has impressed during a six-week loan spell from the Dragons and has agreed a permanent move. “When I came up here there was no guarantee that I was going to stay,” Tovey explained at BT Murrayfield yesterday. “My agent said to me that if I performed well there could be an opportunity and luckily enough that’s happened. Tovey had endured a frustrating season at the Welsh region, where he spent two four-year stints either side of a season at Cardiff Blues. Scotland internationalist Weir arrives from Glasgow in the summer in the search for more gametime out of the shadow of Finn Russell, but Tovey won’t give up the No.10 jersey without a fight, although full-back is another option for him. “It will be good,” he said of Weir’s imminent arrival. “He’s a Scotland internationalist and done well for Glasgow. It’s always nice to have two tens hopefully playing well and the competition will bring the best out in us. The 27-year-old former Wales age-grade stand-off contributed 32 points in his four Edinburgh games and scored his first try for the club in the away defeat to Munster. He was named man of the match in the 29-0 win over Zebre. 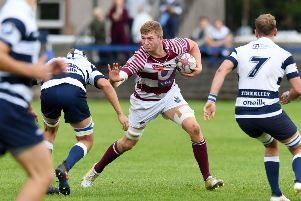 Although Tovey has enjoyed his short time at Edinburgh, there is clear frustration that he couldn’t prevent the team slipping to a disappointing ninth-place finish. He said there is a determination in the squad to do better next season, which will see them move to Myreside in January. “It was obviously tough to take because with three weeks to go we were right in there,” he said. “We had a tough run in, Leinster and Munster away and then a Blues side who had hit a bit of form. “If we are honest with ourselves we threw that game away. We were 17-7 up at half-time then didn’t really get into the game second half. The boys were disappointed and felt they left a few games out there throughout the season. Edinburgh coach Alan Solomons added: “It is terrific news for the club that Jason has committed to us. “He is a quality fly-half and an excellent goal kicker, who has added huge value over the past month or so.